For years, Walter Mancia searched for a chance to discover his talents. As the child of a single mother in rural Honduras, Mancia quit school at 13, in part because his family was unable to afford school materials for him and his three younger siblings. It seemed as though his formal education might be over. Mancia knew there had to be more out there for him, and at 13 he left Honduras and spent the next year travelling alone throughout Latin America. He worked odd jobs in Guatemala, El Salvador and Mexico, before finally landing in the United States hoping to reunite with his father, who migrated to Los Angeles when Mancia was a toddler. Although Mancia didn’t find his father in Los Angeles, he found a love of science. Now a UCLA senior majoring in molecular, cellular and developmental biology, Mancia this week will be among 1,000 student presenters at the 2014 Society for Advancement of Hispanics/Chicanos and Native Americans in Science (SACNAS) national conference, which is dedicated to increasing the number of Hispanics/Chicanos and Native Americans with advanced degrees in science, technology, engineering and mathematics (STEM). This will be the first time Mancia will be presenting his work to a large crowd. “It’s a way to represent your community and to show what you’re doing and inspire other people,” said Mancia, who will present his research on non-coding RNAs and stem cells, specifically on the X-chromosome during embryonic development. SACNAS is holding the conference at the Los Angeles Convention Center from Oct. 16-18. The annual conference is the largest STEM diversity event in the country and is expected to draw 3,800 students and science professionals of color, and professionals and recruiters from the nation’s top companies and graduate schools. Keynote speakers include UC President Janet Napolitano, seismologist Lucy Jones and astrobiologist Jack Farmer. UCLA is a platinum sponsor of the event. The campus chapter, which helped plan the conference, will be picking up its fifth national award in as many years for promoting STEM education. This year the group has been named Undergraduate Chapter of the Year. Students like Mancia are the reason that SACNAS exists, explained Nancy Quintanilla, president of SACNAS at UCLA. 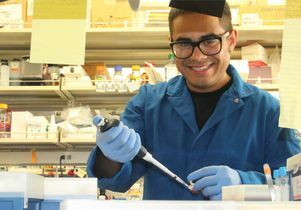 Mancia said that his passion for science, which was sparked after enrolling in biology and chemistry classes at East Los Angeles College, was magnified after he attended the 2010 SACNAS conference, held in Southern California. That event also solidified Mancia’s decision to become a Bruin. “I wanted to do research, and I thought that UCLA was the best place to go,” he said. Robin Garrell, dean and vice provost of graduate education at UCLA, hopes to convince prospective transfer and graduate students that UCLA is the best place for them to develop as scientists. Garrell, who will represent UCLA at the conference’s opening ceremony, will also welcome 100 student conference goers to UCLA on Oct. 16 for a tour of South Campus and meetings with faculty and students in engineering, life sciences, physical sciences and health sciences to learn more about the opportunities available to UCLA science students. 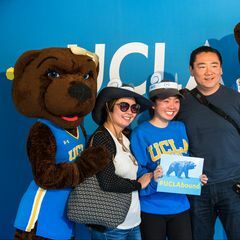 “We want to give them first-hand connections so they can really start building their UCLA network and see what we have to offer,” Garrell said. According to data from the National Science Foundation, the United States has fallen behind in educating its population in the STEM fields, resulting in an increasing dependency on foreign scientists. Of particular concern is the lack of scientists from diverse ethnic and socioeconomic backgrounds, Garrell said. Helping students develop a love for science and technology and encouraging them to pursue it is something that SACNAS at UCLA does well. The chapter will pick up its fifth consecutive national award at a ceremony on Oct. 18. This year, the student organization has been named the Undergraduate Chapter of the Year from among 110 chapters across the country. SACNAS at UCLA picked up this same award in 2010 and 2012. The group earned national SACNAS Role Model Awards for outstanding outreach and collaborative events in 2011 and another for outstanding fundraising initiative in 2013. “The UCLA chapter has proven to be one of the most active and strong undergraduate chapters because of its commitment to helping its membership advance, creating internal and external collaborations; and has done amazing outreach to the surrounding community,” said Rene Moreno, senior program and regional meeting manager for SACNAS’s national office. In addition to supporting its roughly 50 undergraduate and graduate student members through regular meetings and professional development opportunities, a number of postdoctoral scholars, faculty and staff also participate. SACNAS at UCLA also offers educational outreach to roughly 3,000 elementary, high school and community college students in and around Los Angeles each year.